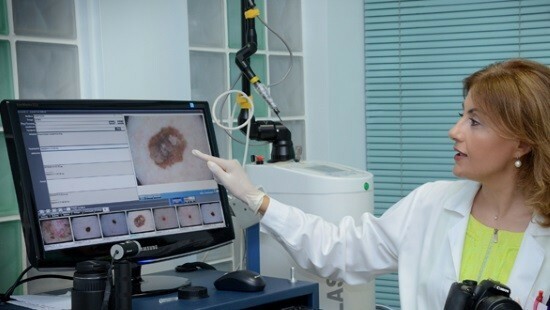 For a very long time, the main method of accurate diagnosis of diseases of the skin was the biopsy of the suspicious area followed by morphological examination. However, in connection with the development of diagnostic procedures to replace invasive biopsy came Dermoscopy, not requiring incisions or excision of skin. This method is widely used in dermatology, mainly for the diagnosis of neoplastic lesions of the skin, such as melanoma, etc. The procedure is performed using special dermoscope able to enlarge the image, which facilitates examination and diagnosis. As a result, the doctor is easier to see the structure, particularly pigmentation and clarity of the edges of melanoma or other skin formations. In addition, digital dermoscope to take pictures that allows you to track the dynamics in the treatment process of the patient. Modern devices can estimate the size of education, its symmetry and other important diagnostic parameters. The possibility of studying small moles and other suspicious objects on the skin with a small size. The method is completely non-invasive and painless. The doctor is able to identify melanoma at the earliest stage of growth of malignant neoplasms. Short duration of procedure is 10-20 minutes. However, Dermoscopy has disadvantages, the most important of which is the low specificity of diagnosis. After the physician of the results of Dermoscopy confirmed fears about the growth of melanoma, the patient still shows a biopsy with morphological analysis. In the presence of pigmented lesions on the skin as a method of screening for tumor growth prior to its excision or cryoablation. Definition of keratoma or various types of keratosis. The presence of the patient hemangiomas or angiomas on the skin. The appearance of signs of malignancy moles: hair loss, pitting surface, skin peeling, etc. In all these situations the patient needs Dermoscopy for diagnosis and determination of further diagnostic tactics. While there is still a need for additional research methods for the malignancy of tumors. The following indications and contraindications to the examination allows to avoid the development of complications and increases the information content of the method. Contraindications to the procedure are connected with the appearance of education on the skin. If it has the form of a knot or devoid of color, then such a survey will not be efficient. Special patient preparation is required. The procedure can be done at any time in a medical facility, including, at the first appointment at the dermatologist. The instruments used are completely safe for humans, are not the source of damaging factors (radio waves, ionizing radiation, etc.). The principle of operation of the device, which is a digital «magnifying glass» can lead to irritation of the skin. To examination for skin lesions should be applied a few drops of oil or any other gel. This eliminates the reflective effect of the skin and increase the permeability of its upper edges, which significantly improves inspection quality. Then, using Dermoscopy, the doctor examines education and makes a series of photographs. As a result, he can estimate the size of the growth, properties, pigmentation, depth, growth and other characteristics. They are all measured in points. How to decipher the results? The heterogeneity of color, the asymmetry of the growth. The presence of foci of white-bluish color. Disturbance of pigment pattern or grid. If the patient has two points or more, then your education may be malignant. However, the formulation of the final diagnosis is possible only after the biopsy and morphological study. 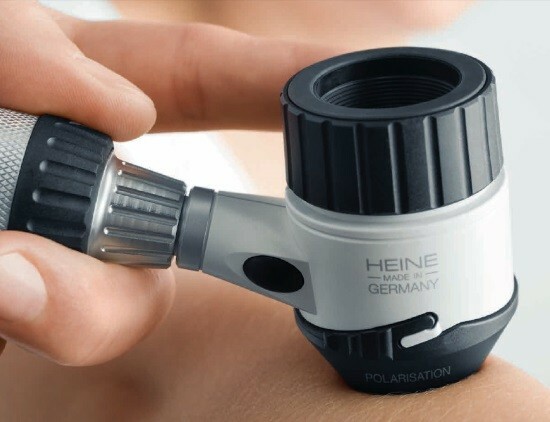 With the melanoma, Dermoscopy is effective and informative method. Due to the fact that this method of diagnosis is non-invasive and completely safe for the patient, it is widespread in dermatology. Studying with dermoscope birthmark, dermatologist is able to assess its internal structure, the nature and depth of the growth, as well as shades of color. Because of this, the doctor can quickly recognize a pigmented lesion from depigmenting, which is especially important for the early detection of melanoma. A large amount of pigment within the lesion may indirectly indicate a malignant character of growth and be an indication for the use of additional methods of examination. All suspicious lesions on the skin should be examined by biopsy after consulting a doctor. 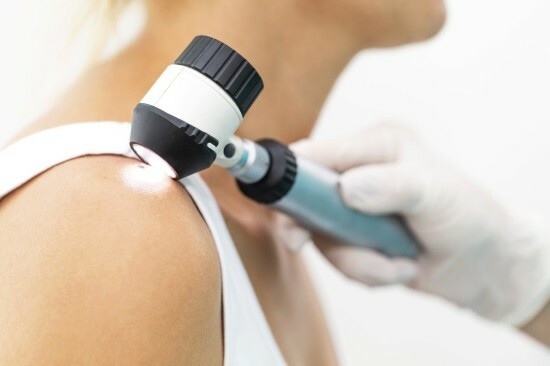 As a rule, in case of detection of melanomas, Dermoscopy used as screening – the doctor quickly weeds out those patients, the pathological lesions on the skin which are not associated with pigment cells, and thus may not be melanoma. This reduces the number of surgical operations and improve the quality of treatment and quality of life of patients. Dermoscopy – popular and informative method that should be used with caution because the diagnostic accuracy is about 80%. All suspicious formation on the skin, which is impossible to assess with it, should be evaluated by biopsy and morphological analysis.